We’re getting close to the point where more artists whose early excursions into rock will start falling by the wayside as the sound takes a more definitive shape, jettisons its remaining links to older forms and when audiences become more selective in their choices. It hasn’t quite happened yet, but we can see the rift starting to form. When we first met Joe Lutcher in December 1947 he was already standing uneasily on the fault line that separated rock ‘n’ roll from the previous styles it’d drew from. In fact we suggested he might’ve been the last guy admitted to the dance before they closed the doors. His background, both as a sax player for the likes of the decidedly non-rock Nat Cole and The Mills Brothers, along with his family-ties as the brother of jazzy chanteuse Nellie Lutcher, would suggest that Joe’s position as a full-fledged member of the growing rock fraternity was tenuous at best. His enthusiasm for the music’s potential, something seen months before it actually emerged as he tried to convince Specialty Records to let him cut more rockin’ sides, ultimately jumping ship to Capitol in a dispute over that very thing, is what got him invited to this dance to begin with, but now that he’s here he’s going to have to earn his keep by adhering closer to the musical standards rock was setting forth or else risk slipping from the ranks altogether. But you can’t say Lutcher was in danger of exactly being forgotten at this point. Though his previous record Shuffle Woogie was hardly cutting edge, or all that exciting for that matter, it had most of the requisite rock attributes that had been featured to date and what’s more it was now a legitimate HIT, slipping onto Billboard‘s Race Charts for a single week in March just as this follow-up was poised to be released. Music tends to move fairly fast though and what cuts the mustard one day is tossed in the trash the next and with rock advancing quite a lot lately thanks to a few records released in the interim (ohh, what the hell, I’ll save you the time of looking them up yourself – Bye By Boogie by Amos Milburn, Cadillac Boogie by Jimmy Liggins, Good Rockin’ Tonight by Wynonie Harris and ‘Long About Midnight by the dude who launched rock to begin with, Roy Brown) the bar was set a little bit higher now and based on his first effort in this realm it was certainly no guarantee that Lutcher would be able to keep pace. He did have one thing going for him, which was the recording ban enacted by Joe Petrillo that was effectively keeping the musical calendar stuck on the standards of December 1947 until the dispute was settled. That meant that records which did move the needle would be few and far between and unlike normal times when those would immediately lead to other artists incorporating those advances into their own work and expanding on them, now there’d be no opportunities to do that, at least on record. If nothing else it gave guys like Lutcher some breathing room, provided what they did in the meantime didn’t set them back any further. His efforts in that regard wind up being something of a mixed bag at best. The record he offers up is a story in three acts. The first is very promising, the second is merely adequate, the third act belongs to another play altogether. 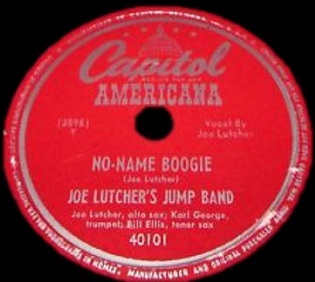 No Name Boogie starts off strong with a rousing horn riff capped by a snake-charmer solo that suggests that Lutcher had correctly predicted the future and would jump to the forefront of the style as it headed forward. It’s seductive, vibrant and alive, getting you to sit up in your seat, maybe even jump to your feet and head out onto the dance floor. But once you’re out there on the floor he gives you little else that will KEEP you there. The enthusiasm itself never wanes but the musical construct quickly retreats to the past. Unlike Shuffle Woogie, which was an instrumental, No Name Boogie contains lyrics. Much like on the similarly named “Rockin’ Boogie”, his pre-rock side from a year earlier, which this incidentally shares the horn intro with, these lyrics aren’t much more than an announcement of his intent, designed to give the listener a way to identify what song it was and to state his aims in playing it. But it’s just that those aims belong largely to yesterday. The solidly riffing horns soon take a back seat to some fairly ham-fisted piano pounding before the trumpet gets a squawking solo. I’ll spare regular readers another harangue about the fallacy of the trumpet as a centerpiece in rock arrangements but suffice it to say it takes up far too much space here, depriving the song of the excitement it was hoping to achieve. The other horns dutifully churn below and provide the strongest rock attributes to be found here but when the trumpet barges in yet again it all just clashes – never animated, just messy – and so the others seem to give up hope of winning the stylistic tug of war and just throw in the towel. The record which had started with such high hopes just falls apart down the stretch. There’s no more vocals, no more saxes, the drums are weak, the piano is plodding, the musical philosophies are worn out, the record is already behind the times. Any thought that Lutcher is going to be at the forefront of anything other than the line for the exit is now just a pipe dream. The sad thing is he still has the right IDEA of what he wants to showcase, he just doesn’t know how to pull it off. He’s correctly pinpointed the excitement generated by a grinding riff to be one of rock’s biggest attractions. He understands that you need to have different elements playing off one another to build to a climax. He even is canny enough to include just enough vocals to remind listeners what record is playing so if they find it appealing they won’t be searching their memories trying to remember the name of it the next time they’re by a jukebox. He GETS all that. What he doesn’t get is how to push those ideas forward to break new ground rather than to hold firm in the old ground while others storm past him in a mad rush for the open prairies yet to be claimed. What he needed to do to capitalize on the energy of the horns in the intro, bolster the delivery of the vocals by gargling battery acid while handing the drummer two sticks of lit dynamite to bash away with behind him, then murder the trumpeter and stuff his carcass in a gunny sack (… or just hand him his walking papers I suppose) and let the saxophones, including his own, take over from there. Streamline it on one hand, while beefing it up on the other. Instead No Name Boogie does the complete opposite. It starts off strong but gets progressively weaker, leaving you with the feeling you went back in time over the course of the record, landing in the era just before rock broke through by the time it all ends. Records like this were already starting to become outdated when he cut it in late 1947, a hybrid sound of the last vestiges of the earliest rock sides along with a lot of stuff rock was busily elbowing out of the way, and by the time this got released in March of ’48 it can’t help but sound anachronistic. As for Lutcher he’s putting himself in a precarious position if he wants to remain a viable rock artist going forward. It’s not just that output thus far has been subpar in its results, that you can at least overcome with some effort, but he’s not lacking in the effort department, it’s the execution stage that’s doing him in. By this point it’s becoming clear that Lutcher and company are falling behind the conceptual curve with no indication he’s going to be able to stop his slide into stylistic irrelevancy. In music it’s all but impossible to catch up with a train that has already passed you by. I’ll be generous and give credit for what does work, and for his overall commitment in making a go of it, but only with the caveat that unless he picks it up soon, Joe Lutcher’s days around here could be numbered. Leave a reply on "Joe Lutcher: “No Name Boogie”"